Farmers are getting less for milk, but retail prices are unchanged. Global skimmed milk powder prices are down, as are India’s exports. A way to absorb surplus could be to include milk in mid-day meals scheme. How have milk prices paid by dairies to farmers, and by consumers buying retail, changed in the last one year? Over the last year, average procurement price for cow milk containing 3.5% fat and 8.5% solids-not-fat (SNF), has fallen from Rs 24-25 to Rs 17-20 per litre in states like Maharashtra. Buffalo milk (6.5% fat, 9% SNF) has fallen from Rs 41-42 to Rs 34-36. But retail price of toned milk in pouches (only 3% fat, 8.5% SNF) has remained at Rs 42 per litre, and full-cream milk (6% fat, 9% SNF) at Rs 52. If consumers are paying the same, why have dairies slashed purchase prices? Dairies broadly do two kinds of businesses. One, branded pouch liquid milk; two, commodities, which is mainly skimmed milk powder (SMP), white butter, or ghee. The present crisis has to do with the latter. From 100 litres (or 103 kg) of cow milk, a commodity-focussed dairy can make 8.75 kg SMP (8.5% SNF) and 3.6 kg ghee (3.5% fat). At current per-kg realisations of Rs 130-140 for SMP and Rs 320-325 for ghee, the gross revenue would be Rs 2,300-2,400. Net of Rs 200 post-procurement expenses (for chilling and transport to the dairy) and Rs 300 processing cost, the most that the dairy can pay to farmers is Rs 1,800-1,900 — or Rs 18-19/litre. Contrast this to a year ago, when SMP rates were Rs 200-210/kg and the corresponding gross revenues (ghee prices have been more or less stable) worked out to Rs 29-30 from every litre of milk processed. Does the same logic apply to liquid milk? Not really. Branded pouch milk, unlike SMP and other processed commodities, is not prone to price fluctuations. The processing and packaging cost in liquid milk is hardly Rs 2.5 per litre. Adding post-procurement expenses of Rs 2, and transport, distribution and marketing charges of Rs 5, dairies can pay farmers even Rs 30-31 per litre for cow milk, and sell it as toned milk (with slightly less fat content) for Rs 42. While liquid milk marketing is viewed as a low-margin business traditionally monopolised by cooperatives, it is the only profitable segment within the dairy industry today. Value-added products — cheese, paneer, yogurts, milk-based sweets, baby food or flavoured and organic milk — may give more margins, but volumes aren’t big. Even then, why should procurement prices fall so much? Branded liquid milk sales in India are roughly 450 lakh litres per day (LLPD). Annual SMP production is estimated at 5.5-6 lakh tonnes (lt). About 11 litres of milk are required to produce 1 kg of SMP, which translates into another 165-180 LLPD. SMP manufacture was a thriving business until about five years ago, when global prices were high and India was exporting up to 1.3 lt annually. Average SMP rates at GlobalDairyTrade — the fortnightly online auction platform of New Zealand’s Fonterra Cooperative, the world’s biggest exporter — hit a record $5,142 per tonne on April 2, 2013. 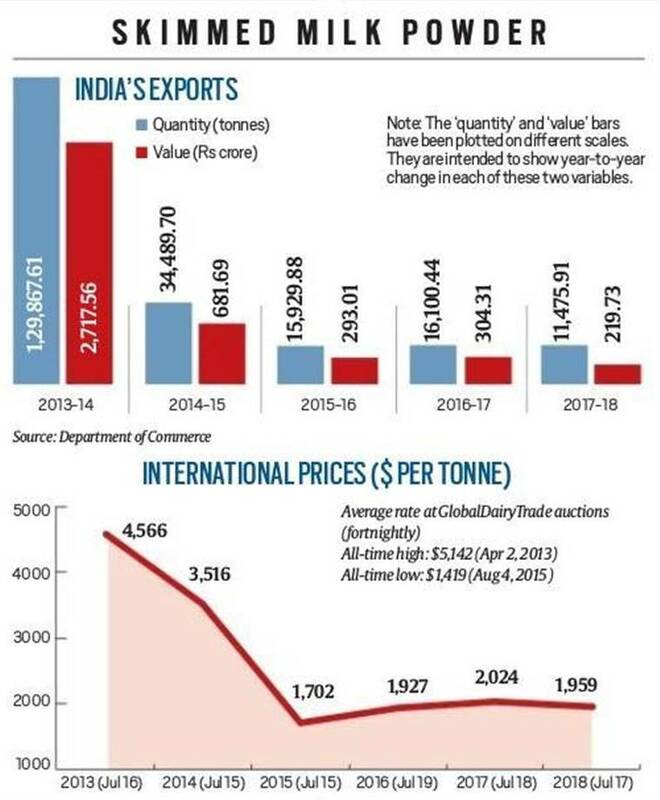 Those prices have since collapsed to well below $2,000, resulting in India’s exports, too, plunging to 11,500 tonnes in 2017-18 (see charts). Reduced exports have meant there is an annual SMP surplus of over 1 lt now, which the domestic market is unable to absorb. Dairies have had to, therefore, either cut procurement — 1 lt SMP is equivalent to 30 LLPD of milk — or reduce prices corresponding to their lower realisations from powder. Will the Rs 5-per-litre subsidy announced by Maharashtra for dairies to convert surplus milk into powder help? Maharashtra’s move will only increase SMP production and add to the surplus. Dairies previously produced powder from the surplus milk during the “flush” October-March season — when animals produce more due to better fodder and water availability, and lower temperatures and humidity — which they used for reconstitution during the “lean” April-September months. But with overall rising milk production leading to narrowing deficits, both across time and regions, the requirement for reconstitution has come down. The bulk of domestic SMPs sales are only to confectionary, biscuit or icecream makers. The only feasible solution to the dairy industry’s crisis is to find a replacement market for the 1 lt-plus surplus SMP. This could be either through a programme of commodity aid to deficit countries in South Asia and Africa, or boosting domestic consumption by including milk in mid-day meal schemes. Giving 5 crore schoolchildren a 200-ml glass of milk each twice a week, would require 95,000 tonnes of SMP.